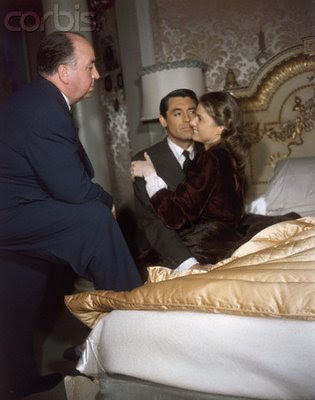 Rare color photo on the set of Notorious. Blogger Alexis Morrell says that she'd like to get into filmmaking and that she's a feminist. It stands to reason, then, that she's a fan of Ingrid Bergman, a woman who thought for herself and fought for her place in the world before "feminism" was a word. It also makes sense that her blog is titled Ingrid Bergman Life and Films. Bergman suffered, not from a lack of opportunity, but from a surfeit. In that climate -- and the material temptations that accompanied it -- she fought for her own identity. As Alexis says in her first post, "she was talented, beautiful, smart, articulate and not afraid to just be who she was, regardless of circumstances." As an Ingrid Bergman geek, Alexis is a girl after my own heart. Check out her blog. Bookmark it. Subscribe. Digg it. Or whatever. You'll be glad you did. thanks a lot for this beautiful photo. who may like HITCH but not love INGRID ?